Uglyworld #639 - Strawberry Raid (188-365), originally uploaded by www.bazpics.com. After a quick visit to the local supermarket this morning to grab some goodies to take back to Germany with me, I had the job of making sure the strawberries my mum picked up went into her fridge ready for her to munch on after work. I should have been more careful, as while I was upstairs packing my stuff away I could hear something going on downstairs in the kitchen, and when I went to investigate this is what I found!!! 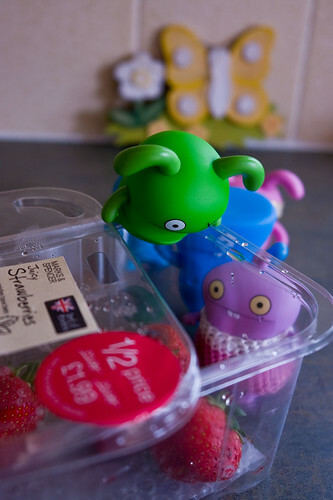 Definitely some Mission Impossible strawberry raiding going on here! After giving the guys a ticking off I picked up some more strawberries and made them promise not to raid them once I left for my long drive down from Glasgow in Scotland Ashford near the South East coast of England today.